This review has been languishing in the ‘must-write’ pie for months and it’s a damn disgrace. The delay that is, not The Girl Who Would Be King which is bloody splendid. Kicking myself now for not having spread the word sooner. I think I heard about this one over at io9 and ended up downloading it as a spot of light reading for my summer holiday back to Scotland. Good choice yet bad choice – it had me utterly rapt from beginning to end but unfortunately was over in a flash as I devoured the majority of the pages on one sleepless flight. But anyway, before the praise I’d best go through the formalities. Bonnie Braverman was orphaned by a fatal car accident, leaving her to spend much of her youth in a group home and pining for the return of her long-lost brother. Always the shy and retiring type it comes as something of a surprise when she finds herself rescuing one of her fellow inmates (for want of a better word) from the clutches of an imposing bully and her gang. Surely people aren’t normally able to hit that hard? And did she really just jump onto the roof of that building? Something has awoken inside Bonnie and it begins drawing her inexorably towards her ultimate fate. The other half of that fate is Lola LeFever, a girl of similar years and verging on adulthood. Lola shares Bonnie’s orphanhood but with a slight difference – she murdered her mother herself in pursuit of a power she believed her to possess. A power which was Lola’s birthright and squandered by her useless, drug-addled mother. Before long she too is feeling the draw of the force inside her, leading her towards her opposite number, her nemesis. The Girl Who Would Be King pitches a fairly classic good-vs-evil story put dresses it up with two post-adolescent American girls donning superhero costumes and trying to figure out just what they’re capable of. Woah, holy coming-of-age metaphor. You might guess from the subject matter that Kelly Thomson doesn’t take things too seriously but the book does actually have a fair amount of emotional heft and depth to it. While Lola’s story does provide some wonderfully over-the-top supervillain shenanigans there’s a whole lot more darkness and gravitas with Bonnie as she struggles to do the right thing while the world’s deck of cards seems stacked against her. Actually, halfway through the novel I kind of expected a ground-shaking plot twist as a result of Bonnie’s trial by fire. I could smell it coming, it seemed like such a perfect way to throw expectations out of the window. When it didn’t happen I almost wanted to hunt down Thomson’s email address and just ask, “Why??? Why didn’t you go this way?? ?” But in the end it didn’t matter because the way things unfold is just fine. 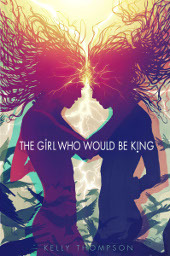 Sometimes it’s okay to just play it straight and keep piling up the tension until the grand finale and that’s the way it happens with The Girl Who Would Be King. So yeah, maybe it missed a fantastic switcheroo but there’s still plenty to recommend this novel. An original plot despite borrowing heavily from the usual superhero tropes; two very strong characters in the form of Lola and Bonnie; and some action so ridiculously fun that Amazon had to print a disclaimer on their site that this is a prose novel, not a comic. It’s lightweight for sure but no less fun for that and noteworthy for the fact that its creation was funded by Kickstarter. Definitely one with which to while away the incoming winter nights.